Numenera and The Strange have been a massive success for Monte Cook Games, and now the core rules that drive both games will be licensed to other game designers and released as a multi-genre RPG toolbox. The first official license is the fantasy noir Shotguns & Sorcery. One of the great things about Numenera, aside from the science-fantasy setting (and The Strange's trippy techno world-hopping), was the easy to grasp, fun to play rules system. It put a lot of agency in the players' hands, but also gave the GM the power to throw crazy, creative wrenches into the story. The use of Gamma World-esque temporary powers and abilities keep things weird and propel encounters forward. 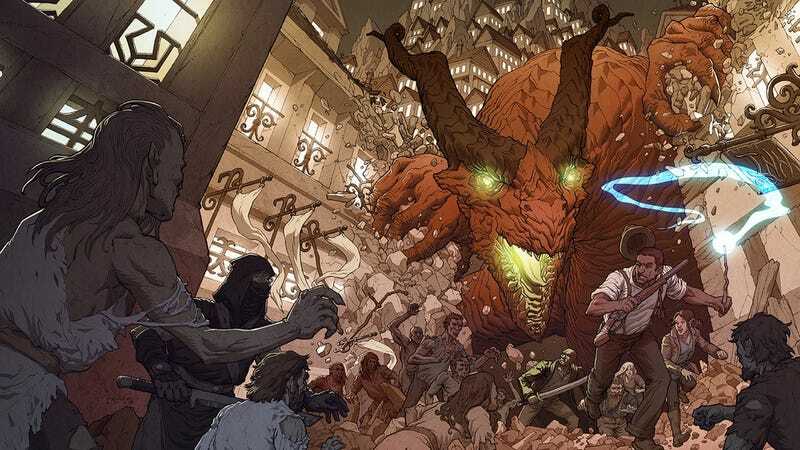 Shotguns & Sorcery is set in Dragon City, a grim and gritty fantasy metropolis built on top of and inside of a walled-off mountain and ruled over by the Dragon Emperor. Legions of zombies scratch at the cut stones of the Great Circle every hour of the night...Robbing the ruins that lay outside the Great Circle is illegal, but it's the best way for people with questionable talents with rune-laced shotguns to keep the gold flowing. And most days it beats selling dragon essence to the addicts who use it to fuel their magics, or hiring out as muscle for the dwarven gangs. The 300-page hardcover core book has a December 2015 release date. You can get a taste of the world of Shotguns & Sorcery by downloading Forbeck's short story Goblintown Justice for free. Top Image: Shotguns & Sorcery front cover by Jeremy Mohler. If you've got some ideas for your own ways to convert the Cypher System to a new genre or setting, but you're not quite ambitious enough to license and publish your own RPG, MCG has you covered. The Cypher System Rulebook, scheduled for summer 2015, will be more than a generic RPG system — it will contain tons of new character options, genre specific rules, setting ideas, and advice for running the game in your setting of choice. "It will draw in part from content already published in Numenera and The Strange, but tailor that to play in different genres, and add hundreds of new types, descriptors, foci, creatures, cyphers, and genre-specific rules elements," as the press release so succinctly puts it. But that's not all that's going on with Monte Cook Games these days. They also just launched a Kickstarter for a boxed set of Numenera. Since the North American gaming market doesn't seem to support producing boxed sets for retail sale, this is something of a boutique release, only available through the KS. You can get an empty box to hold the Numenera stuff you already have, get a box with the basic Numenera box in case you don't have them yet, or get a deluxe box that I suspect is going to be literally bursting with all the crazy stretch goals they're planning to cram in there.